We visited this park on November 14, 2014, and stayed for 3 day(s). 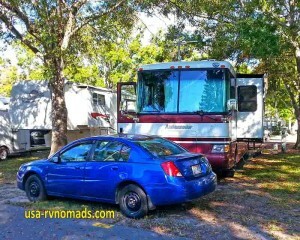 We chose Vacation Village RV Resort for our short stay while working a nearby event in Largo, FL. It was fine for an overnight, or a few nights, but we personally wouldn’t want to stay there again. The park is clean and convenient, with a nice pool and clubhouse, but it’s also the closest we’ve come to trailer park living since beginning our RV adventure. Sites are very close together and tree limbs hang low over the roads and many of the sites. Jerry had to climb up on our roof to remove a dead limb that was interfering with our TV antennae. The park was fairly full, mostly with older long-term campers and park models. We were assigned a back-in site on the outer loop and our view out the front window was the back patio and windows of the next subdivision. On our right was a long-term fifth wheel resident, almost within arm’s reach of our living room window. We had no neighbor in the site to the left of us, but there was a tree in the middle of that site, so using that site might be difficult for anything but a small camper. 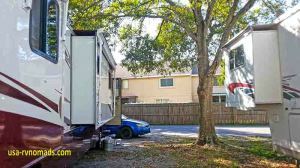 The park is right on Ulmerton Road, a major thoroughfare with lots of traffic. If coming in from the north, you’re expected to do a U-turn to cross traffic and enter the park. We found this impossible, so drove down a few blocks to where Google Maps erroneously told us we’d be able to go around a block. We wound up having to unhook our tow vehicle so that we could get turned around. On the plus side: The price was right at $23/night with our Thousand Trails membership. We had a strong Verizon data connection, and decent over-the-air TV. Everyone we met was friendly.